If you’ve ever been on the end of a lead rope trying to coax a balking horse up into a horse trailer, you’ve witnessed firsthand the effects of stress on your horses. Sure, that trailer can look like a scary place to be — but horses may be less intimidated by the trailer itself than by the thought of being on the road traveling. You probably already know the signs of stress in a horse — pinned-back ears, a rolling eye, moving away from a stressor, pawing at the ground or whinnying anxiously. And you’ve probably also taken steps to help alleviate that stress by removing the source. In the case of travel-induced anxiety, though, there’s very little you can do to help — particularly if getting to your destination isn’t merely optional. And before you decide that your local and regional horse shows “couldn’t possibly be stressing your horse out” because they’re only a short distance away, consider this: In a study published in the Journal of the American Veterinary Medical Association, a group of ulcer-free recreational horses were exposed to activities associated with going to a show without actually competing. Seventy percent of the horses developed ulcers within five days. That means that your local show may cause your horse as much situational stress as the national championships, so it’s smart to do whatever you can to keep your horse as stress-free as possible. At issue are all the activities associated with showing, not just the competition itself. Many horses experience GI distress associated with traveling. 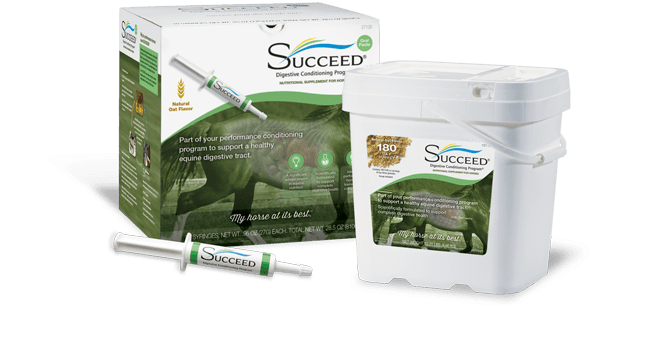 This is a problem, as these issues — loose stool or impaction, digestive imbalance, a compromised digestive system, or even stomach or colon ulcers — can cause big problems for your horse. Digestive issues such as these have been linked with dehydration and compromised nutrient absorption, and can also affect attitude and general behavior. But here’s the good news: You can help your horses avoid some of these major GI stressors simply by rethinking the way you approach traveling. You might think the hardest part of traveling is actually getting your horse on the trailer, but your horse likely doesn’t stop stressing once you’ve pulled out the driveway. How to fix that problem? As with most types of anxiety, the best way to alleviate it is to make it seem so routine that your horses don’t even think about it anymore. Pretend it’s the morning of a horse show. Put your horses in cross-ties, groom them, and wrap their legs. If they’re ok with that, go ahead and load them into the trailer. If they’re calm, hang a hay net and let them spend a few minutes munching and relaxing before unloading, unwrapping legs and turning them out. Repeat every few days until it’s part of the normal routine. Once your horses have done all of the above calmly, repeat all of the above, but this time, take a short drive. Do your best to recreate the stress of showing — without actually entering a class. Let the horses eat hay and relax on the premises until they’re no longer alert and wide-eyed at the activity around them. The second part of teaching your horses to travel is to feed them in a way that supports the digestive system throughout the entire experience. Feed all horses for optimum health by starting with a forage-first diet, fed in an appropriate manner. You want your horses to start out healthy before even considering a road trip. Just as you want to create a routine of calm, easy trailering to and from horse shows, you also want to maintain your feeding schedule while asking for things outside of the normal routine. Digestive imbalance can be caused by even small changes to a horse’s routine, so it’s best to try to mimic a typical day as much as possible. If your horses have limited access to forage right now and you’re not feeding free-choice hay, it’s time to break that cycle. When horses are on the road, their digestive systems are even more sensitive to the kind of heavy, starchy food that’s been marketed for horses — but that isn’t really appropriate for the way the equine digestive system works. A full hay net will help the horse digest food better by upping saliva production, provide a buffer of forage in the stomach for improved digestion, and maintain focus and calm. Horses often sweat more on the road, and often are less inclined to drink. Yet dehydration increases your horse’s risk for impaction colic and digestive imbalance. Encourage hydration by feeding hay nets soaked in water, or soaked beet pulp (try this at home first). Offer water every three hours, and consider packing water from home (in a familiar bucket) or get your horses acquainted to flavored waters at home to mask the taste of unfamiliar water on the road. It’s no secret that horse trailers are cramped. If you’re traveling for more than a couple hours, be sure to unload and let your horses walk around, drink water, and relax. When you arrive at your destination, take your horses for a walk, or turn them out in a safe spot. Movement helps with digestion — and can also help them settle into a new location. Horses are creatures of routine. 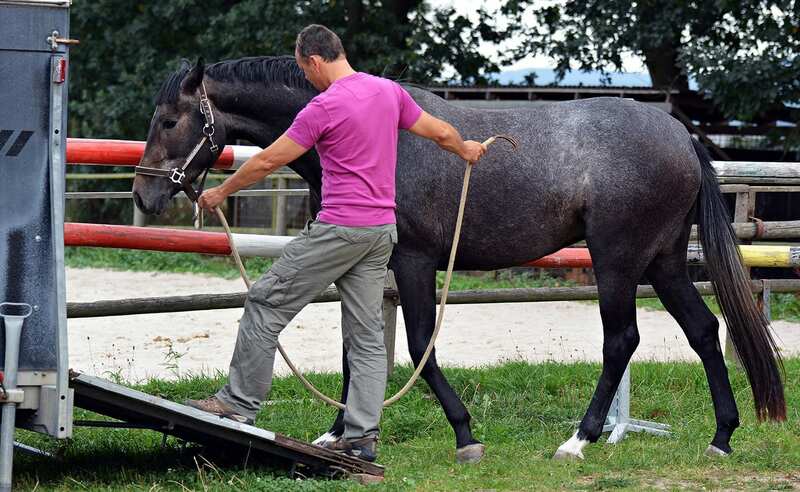 Yes, a new location will necessarily change some of your horse’s familiar routines. But do your best to keep on track as much as possible. 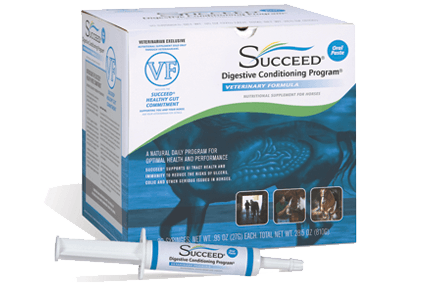 Even with doing all you can to reduce stress and ensure comfort, the lifestyle of the performance horse will always challenge digestive health. Many professionals recommend feeding horses additional nutritional support to maintain digestive health before and during travel. There’s no doubt about it — traveling is stressful for horses (and for you). 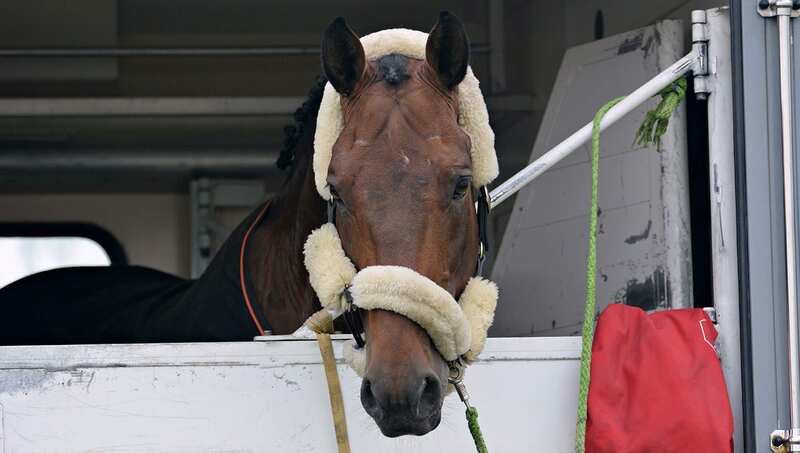 But with a plan in place and plenty of practice, it’s possible to alleviate some of your horse’s anxiety to make packing up for a horse show seem like just another part of his normal routine.